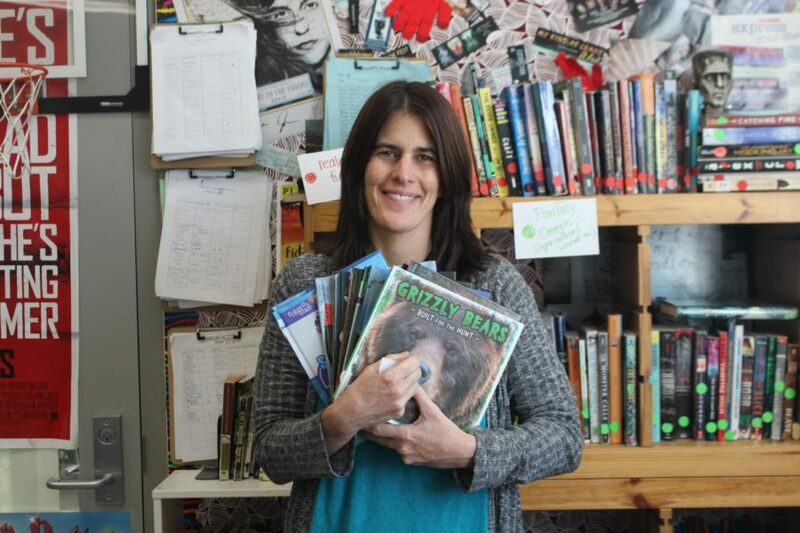 Teacher Lori Polydoros in her classroom, holds just some of the books she has written. Lori Polydoros is more than just an English teacher. She’s a novelist, writer, mom, wife, and professor at Irvine Valley College. But Polydoros’ passion is to write and in order to make time for her passion, she has had to make sacrifices. In college at Cal State Long Beach, she wrote for the school newspaper the Daily 49er. Polydorus started writing seriously to get published in the paper, which gave her better experience with writing. But while in college, Polydoros had built up serious credit card debt. As a broke college student, her mom encouraged her to become a teacher to pay off her debt. After earning her journalism degree from CSULB, and her elementary credential from Chapman University she began to teach as a substitute. At one of her substitute job assignments, the school sponsored a BMX show for the students. Reeling in a bunch of 6th graders turned out to be a challenge for Polydoros but the BMX guys performing showed compassion and a sense of humor for the young teacher. Leaving their business cards for future performances, Polydoros called one of the performers to thank them and eventually, he became her husband, Dan. For 10 years, Polydoros taught elementary school. She loved the kids, the adventure of teaching but her job was all encompassing. So when the young couple decided to start a family, Polydoros knew this would be the right time to take a break from teaching. She soon started to write in the kids’ and teens’ genre, after her son was born. She always loved writing, but her son’s birth was the push she needed to write for kids. So how does she juggle teaching, family and writing? Polydoros starts writing when everyone falls asleep. “I love staying up, drinking my tea and adventuring in another world,” said Polydoros. She takes a lot of notes on paper and writes first the action then the dialogue for her stories. Polydoros eventually came back to teaching because she needed a salary for her growing family and made sure that writing has not taken a back seat. With a single subject English credential from Cal State Fullerton and a masters in English with a focus in creative writing from Southern New Hampshire University, teaching high school is the perfect fit for the author in her. Currently, she is teaching freshman English and AP Literature. Senior Vanessa Garcia who currently has Polydoros for AP Lit. sees her teacher as “sweet, caring and nurturing.” Garcia mentioned that the class is tough but Polydoros always reassures her students that “we’ll get through this together” and it shows how much she really “loves her students,” added Garcia. “She’s a very understanding teacher and knows her curriculum,” said senior Marie Mejorado who is also taking her AP Lit. class. Polydoros makes time to write, by prioritizing the things she needs to get done and makes sure to make time for her family. With a daughter who is 14 and her son now in college, those late nights are getting a little easier to find. Currently, she has written more than 75 stories and books for national book companies. Her ultimate goal is to get one of her novels published not as part of a book series but as a stand alone novel all her own. “That’s the dream,” she said. And with each new story she gets published, the hope is her dream will come true soon. Thanks for the honor of being the staff spotlight!!! I love the Grizzly Gazette!